This room at the Seaport Hotel is one of the prettiest in New England for wedding photos. Its entirely glass and the light coming in is to die for. You couldn't screw up a photo here if you tried. Ashley and Joe were married here and we did some amazing photos in this room. I love this room because of how the green plants sort of break up the white of the room. 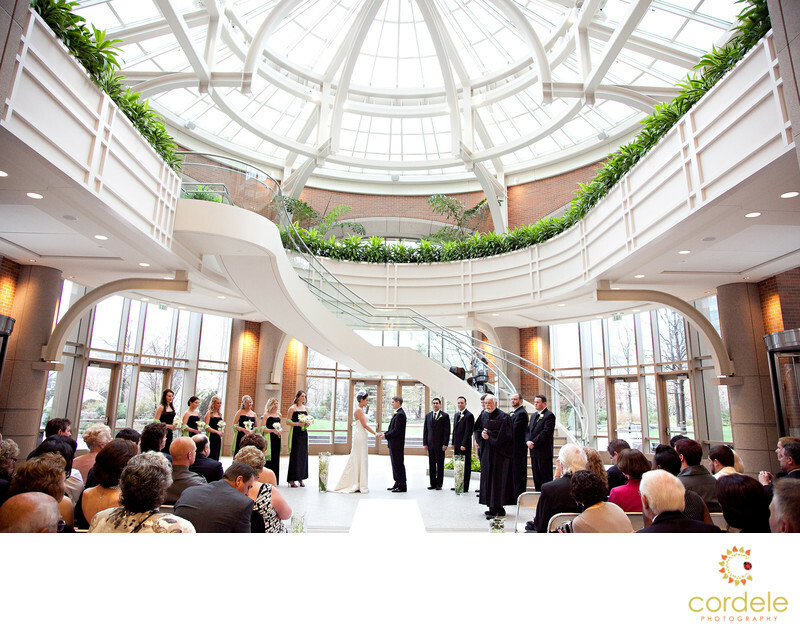 The sweeping staircase gives the guests a view of the bride before the groom, which is so different. The Seaport Hotel is over the bridge from Commerical Street in Boston. You can look over the harbor and see the North End and the custom House. The views from the hotel are spectacular. The Seaport Hotel is located down on the waterfront in Boston Massachusetts. Location: Seaport Hotel 1 Seaport Ln, Boston, MA 02210. Keywords: glass ceremony (3), glass roof (3), new England venue (3), roof view (3), Seaport Hotel (3).